Star Trek 50th Anniversary Cover Celebration Signed by 22 Artists! 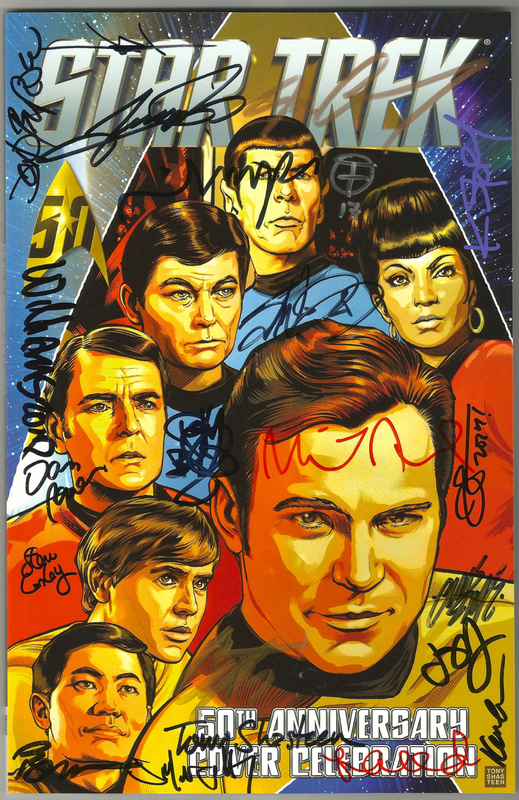 Released in 2017 during Star Trek’s 50th anniversary year, this Anniversary Cover Celebration from IDW is signed by hand by 22 contributing artists, including issue cover artist Tony Shasteen, movie poster icon Drew Struzan, comic legends John Byrne, George Perez, Jae Lee, Phil Jimenez, and Mike and Laura Allred, as well as a lineup of comics top creative talents, including Tim Bradstreet, Joe Corroney, Jen Bartel, Jeffrey Vergge, Steve Conley, Cat Staggs, Chris Spouse, Dan Parent, Karl Story, Francesco Francavilla, David A Williams, Sean Gordan Murphy, JK Woodward, and Kevin Wada. It is in excellent condition and will be shipped with the utmost care. Please note- the signatures are all real- all are signed by hand by the respective artist. They are not pre-printed images on the comic.